It’s Saturday, which means it’s time for my weekly $50 Target WOW Gift Card Weekend Giveaway! Every week I load $50 onto an extra fun Target Gift Card. These special gift cards all have some kind of fun twist to them and are now retired and can no longer be purchased in store or on Target.com. 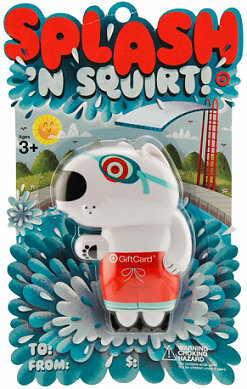 I just love this week’s Splash’n Squirt Gift Card as it is a nifty water squirter in the shape of Bullseye The Dog. There is a valve on the back that you can open to fill him up with water, and then you just point and press his paw to let the water fun begin! This WOW card is super-fun and Bullseye is just too cute with his water goggles and red swim trunks. This great card is sure to be a hit with kids of all ages and the winner will be especially happy since it will come pre-loaded with $50 on it to spend on whatever they wish! Optional Entry #2: : Like TotallyTarget on Facebook OR Subscribe to Totally Target via e-mail OR Follow Totally Target on Twitter. Just leave a comment letting me know which other way you chose to follow the blog. If you already follow one of these ways- that counts too and just leave me a comment letting me know! Thank you for the giveway! Target is my favorite store to shop at! I subscribe to Totally Target, thank you. Targets one of my favorite stores! I hope i win this time!!!! thanks for the chance.